In Greek mythology, the Chimera is a monstrous creature that was composed of several different animals. The chimera is only one of several famous mythological hybrids. As with all mythical creatures, there is the question of its origin. In some traditions, the Chimera was one of the offspring of Typhon and Echidna and sister of such monsters as Cerberus and the Lernaean Hydra. However, the chimera does not appear to have an existence in physical reality, save for the individual animals from which it is composed. While minor in literature, the chimera was nonetheless exceedingly popular in ancient art, and is featured in many depictions of epic scale. In pop culture, a chimera may refer to any creation that is a hybrid, or a single entity composed of two or more distinct entities. It is often used in television shows and role-playing games, usually as an obstacle for players to overcome. Thus, the chimera represents the most dangerous beast that the human imagination can conjure, taking those attributes of existing creatures to develop a new creation that is more difficult to overcome. The role of such creatures has thus been to challenge the hero to use bravery and strength in order to achieve victory. The word chimera comes from the Greek Χίμαιρα, which translates as "she-goat or monster." Through the Latin Chimaera comes the English version, which has a second definition, according to the Oxford English Dictionary, as being "An unreal creature of the imagination, a mere fancy; an un-found conception." Along with these two meanings are a host of variants on the root word: Chimeric is something that is "fanciful or imaginary"; Chimerical is something "of the nature of the chimera; vainly or fantastically conceived"; and Chimerize is the act of indulging "in chimeras, indulge and foster wild and unfounded fancies." The most common description of the chimera comes from Homer's Illiad, in which the creature is said to have the head of a lion, the body of a goat, and tail of a snake. It is also believed to breath fire and be female, despite the mane adorning the lions head. The chimera was said to be incredibly vicious and powerful, especially since as one single creature, it possessed the abilities of three separate animals. Fires of Chimera, Çıralı, Turkey. Some say this geothermically active region was the inspiration for the myth. The chimera is only one of several famous mythological hybrids: Pegasus, Medusa, the Minotaur, and the Griffin are all examples of creatures that are composites of real animals. The combination of attributes often represented something to the people who created such myths. One possibility is that the chimera could actually be a representation of the land where the creature was attributed to be living in Lycia, Asia Minor. Ctesias identified the Chimaera with an area of permanent gas vents which can still be found today by hikers on the Lycian Way, in southwest Turkey. 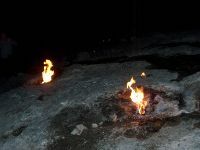 Called in Turkish, Yanartaş (flaming rock), it consists of some two dozen vents in the ground, grouped in two patches on the hillside above the Temple of Hephaestus, about 3 km north of Çıralı, near ancient Olympos, in Lycia. The vents emit burning methane thought to be of metamorphic origin, which in ancient times sailors could navigate by, and which today the custodian uses to brew tea. The place name is attested by Isidore of Seville and Servius, the commentator on the Aeneid. Isidore wrote that Mount Chimaera was on fire here, had lions and goats there, and was full of snakes over there. Servius goes so far as to arrange these with the lions on the peak of the mountain, pastures full of goats in the middle, and serpents all about the base, thus imitating Homer's description of the chimera exactly. In some traditions, the Chimera was one of the offspring of Typhon and Echidna and sister of such monsters as Cerberus and the Lernaean Hydra. There are several different genealogies—in one version, it mated with its brother, Orthrus, and mothered the Sphinx and the Nemean Lion. The Chimera has a small appearance in Greek mythology. The hero Bellerophon had an affair with Anteia, but broke it off suddenly and would have no further contact with her. Enraged, Anteia turned to her husband, King Proetus, telling him that their guest had dishonored her and deserved to die. The King, however, was unwilling to kill Bellerophon, so he sent him to the King of Lycia in Asia, secretly requesting that he kill Bellerophon. The King of Lycia was just as hesitant, for Bellerophon had been his guest for over a week and Zeus looked poorly on those who broke the sacred bond between guest and host. In the kingdom lived the chimera, which no one was able to kill, and thus the King of Lycia sent Bellerophon on a mission to kill the beast, knowing full well that he would perish in the act. Bellerophon had an advantage over all others who had faced the chimera, however, in the form of Pegasus the winged horse. With great ease, Bellerophon flew high above the chimera, away from its fiery breath, and shot the creature full of arrows until it died. Bellerophon fighting the Chimera. Side A of an attic black-figured “double-decker” Siana cup, ca. 575–550 B.C.E. Found in Camiros (Rhodes). The Chimera was placed in foreign Lycia in mythology, but its representation in the arts was wholly Greek. 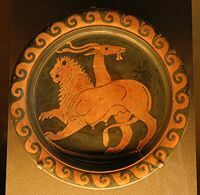 The Chimera first appears at an early stage in the proto-Corinthian pottery-painters' repertory, providing some of the earliest identifiable mythological scenes that can be recognized in Greek art. The Corinthian type is fixed, after some early hesitation, in the 670s B.C.E. 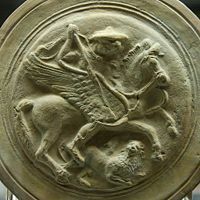 The fascination with the monstrous devolved by the end of the seventh century into a decorative Chimera-motif in Corinth, while the motif of Bellerophon on Pegasus took on a separate existence alone. A separate Attic tradition exists, where the goats breathe fire and the animal's rear is serpent-like. Two vase-painters employed the motif so consistently they are given the pseudonyms, the Bellerophon Painter and the Chimera Painter. In Etruscan civilization, the Chimera appears in the "Orientalizing" period that precedes Etruscan Archaic art; that is to say, very early indeed. The Chimera appears in Etruscan wall-paintings of the fourth century B.C.E. In Medieval art, though the chimera of antiquity was forgotten, chimerical figures appear as embodiments of the deceptive, even Satanic forces of raw nature. Provided with a human face and a scaly tail, as in Dante's vision of Geryon in Inferno (xvii.7-17, 25-27), hybrid monsters, actually more akin to the Manticore of Pliny's Natural History (viii.90), provided iconic representations of hypocrisy and fraud well into the seventeenth century, through an emblematic representation in Cesare Ripa's Iconologia. To differing degrees, the chimera appears throughout pop culture. With many of the classical creatures, the chimera shows up in such role-playing games as the Dungeons and Dragons series, as well as the popular video-game series Final Fantasy, often as obstacles for the players to overcome. Many of the most successful products in the Science Fiction genre, Star Wars, Star Trek, and The X-Files, employ chimeras, often building upon the scientific usage of the term to describe biological and genetic hybrids, sometimes monstrous creatures or viruses that science has created. ↑ Harry Thurston Peck, Harpers Dictionary of Classical Antiquities: Chimaera. Retrieved August 15, 2014. ↑ Anne Roes, "The Representation of the Chimaera," The Journal of Hellenic Studies 54, No. 1 (1934): 21-25. ↑ John F. Moffitt, "An Exemplary Humanist Hybrid: Vasari's "Fraude" with Reference to Bronzino's 'Sphinx'," Renaissance Quarterly 49, No. 2 (Summer 1996): 303-333. Graves, Robert. The Greek Myths. Baltimore: Penguin, 1960. Harper's Dictionary of Classical Antiquities. Chimaera. Retrieved June 25, 2007. Kerenyi, Karl. The Heroes of the Greeks. London: Thames and Hudson, 1959. Peck, Harry Thurston. Harpers Dictionary of Classical Antiquities. 1898. This page was last modified on 15 August 2014, at 21:03.